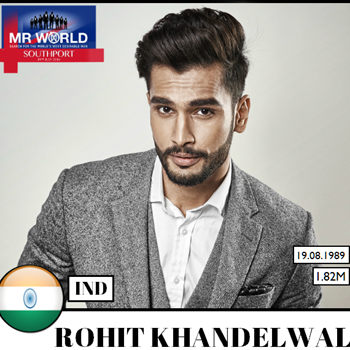 Rohit Khandelwal has become the first Indian to win the coveted title of Mr. World at a grand ceremony on 19th July 2016 at Southport Theatre, Floral Hall, The Promenade, Southport. The competition saw 47 participants from around the world, giving him a stiff competition. Rohit Khandelwal received a whopping cash prize of $50,000/- on winning this celebrated title. Rohit looked dapper in a tuxedo designed by Couture designer Nivedita Saboo. Rohit was seen competing fo r various sub-titles at the pageant like Mr. World Multimedia Award, Mr. World Talent, Mobstar People’s Choice Awards, Mr. World Sports Event and many more and won the sub-title of Mr Multimedia. Apart from Rohit, Mr Scotland won the Extreme challenge, Mr England was the winner of Sports challenge, Mr China won Style and fashion and Poland won the talent challenge. They were fast-tracked to TOP 10 of Mr World 2016. I still can’t believe that I have won the Mr. World title. Being the first Indian ever to win this title internationally makes me immensely proud and ecstatic. From being a boy next door to representing India at Mr World 2016, Rohit Khandelwal’s journey has been an inspiring one. Rohit who was crowned Provogue Personal Care Mr. India World 2015 has been trained by the best experts in the fashion & glamour industry like Sabira Merchant, Supreet Bedi, Jamuna Pai, Dr.Sandesh Mayekar, Bodyholics, Kromakay, Amit Khanna, Swaroop Medara, Rukshana Eisa and many more who contributed to his success today. He was also given special Football and Circuit training to increase his endurance and perform the various physical challenges at the pageant.